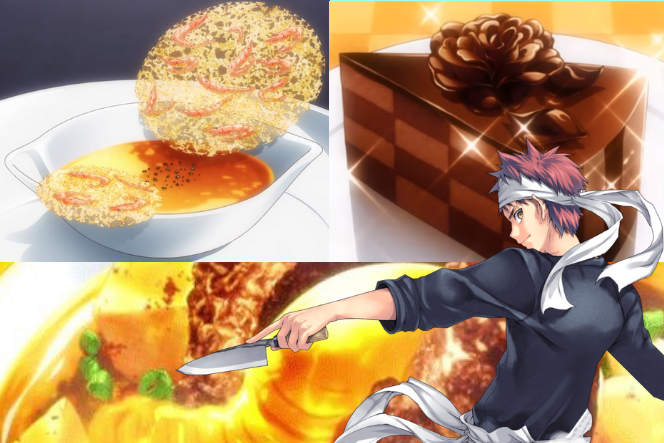 After another delectable season of Food Wars comes to a close, we are all left salivating over the dishes that Soma and his friends created. From succulent venison to squid and peanut butter, we were always wondering how these culinary masterminds would trump their last creation with the third plate being the best yet. I’m having a foodgasm and it was hard to pick a top 10, but here we go. 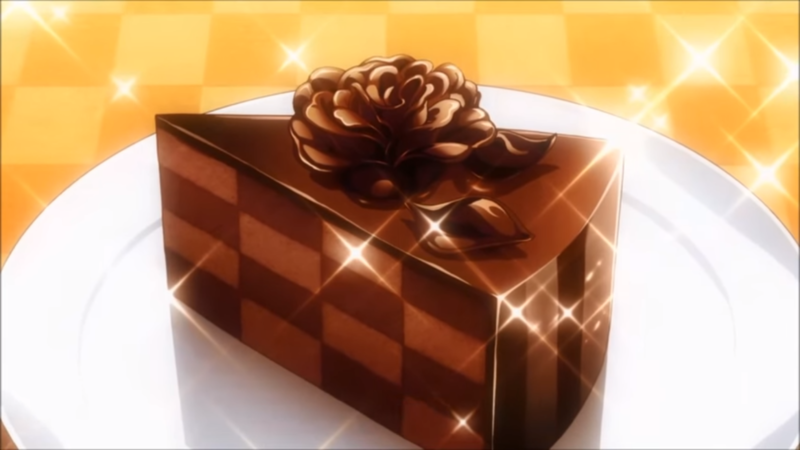 Starting off with desert for once, we have Momo Akanegakubo, Tōtsuki Academy’s Fourth Seat of the Elite Ten and her Chocolate Covered Checkerboard Cake. Perfection on a plate made by the dessert goddess herself. This dish was served in her shokugeki against Chocolate RS during the Survivors’ purge. It was a bittersweet end to the Chocolate RS’s club but a delicious meal for our eyes to feast on. 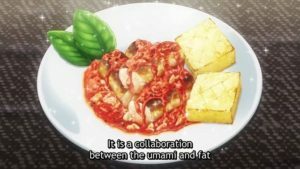 One of the first meals we were introduced to this season, Yukihira Soma’s innovative combination of curry, meatballs and mapo tofu. Soma created this meal to compete with the then current 8th seat of the elite Ten, Terunori Kuga during the Moon Banquet Festival. In order to beat Kuga in sales, Soma needed to match the spice and umami of Kuga’s Chinese cuisine specialty. With this dish, he was able to overcome the mountain which was the Chinese RS’s head and take out his groups sales in the Moon Banquet Festival. Even thinking about the broth, meat and supporting ingredients make my mouth tingle. Up next is the nine-course meal that anyone would die for. 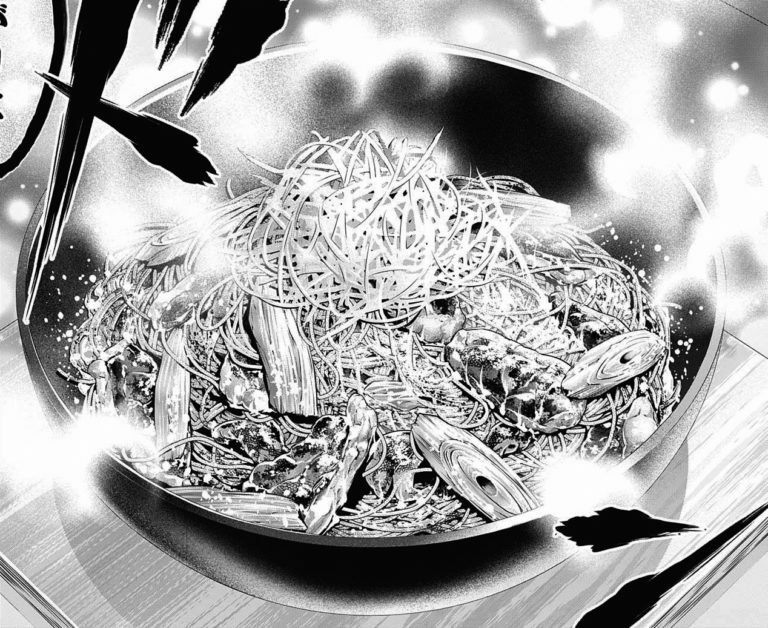 Referred to in the Food Wars manga as A Symphony of Fall Ingredients, this series of dishes concocted by The Elite Ten’s First Seat, Eishi Tsukasa, gave us a set of French courses to die for. Each one was tantalizingly different with Soma, Rindo and Tadokoro looking like they were having the time of their lives. This was the first time we were introduced to Tsukasa’s unbelievable culinary abilities and amazing dishes. My favourite from the set was his Amuse Bouche. The first dish of this season to break through the clutter is none other than a classic Hujiao Bing dish with a twist, made by Sōma Yukihira and Jōichirō Yukihira. Soma used this Taiwanese snack dish to attempt to beat out Kuga in the Moon Banquet Festival. It is made by using minced pork spare ribs which are marinated in black pepper, molding it into a meatball, wrapping it with a batter of flour and then baking it in a clay oven. A great introduction back to the series. 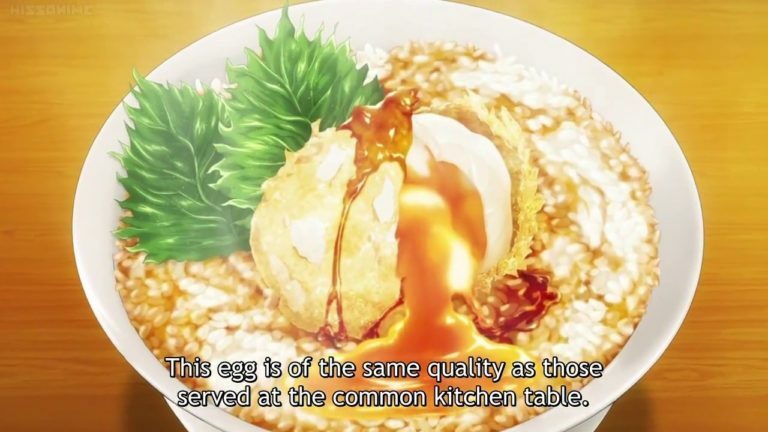 A wild throwback to the first season of Food Wars, Chicken Egg Tempura Don was made by Soma for Nakiri Erina, resembling the first dish Soma has ever made for her God Tongue. Chicken, eggs, tempura, rice who doesn’t love a good Donburi! The part that gets my mouth watering is the frozen deep-fried egg which is soft boiled and spills over the dish, it’s electrifying. The final dish made by Soma this season finds itself here surprisingly. It looked delicious, had a great reaction with the judges and allowed him to triumph over the Elite Ten’s 6th Seat, Nene Kinokuni. I am a HUGE fan of soba and the fact that it’s kind of like a stir-fry in this meal has me salivating. It was tough to decide between Nene’s and Soma’s soba dishes as both conveyed the great flavor the comes along with soba. Just talking about it makes me want to have some. What do I want every cold winter night right now? Team Dōjima’s Hachis Parmentier. OH MY GOD. Like. This takes me back to my childhood where all I would eat is Shepard’s Pie in winter, but this is at least 10 times better. The light and fluffy mashed potato with a sofrito ground beef sauce is delectable and don’t even get me started on the Anchoïade Sauce atop the masterpiece. A literal eyegasm is how I would explain my feelings towards this one dish. Described as an equally harmonic and tranquil dish with extreme care taken towards each ingredient, Tsukasa finds his Venison Roast Showing Two Expressions in third place on this list. Venison is one of the most luxurious meats to eat and its appearance here is no exception. He skillfully created this French dish with two different sources harbouring powerful flavours on their own. Okay, I know this dish lost to Satoshi Isshiki’s beyond awesome eel dish, but I just couldn’t pass up this amazing Italian cooking. It looks beyond divine. 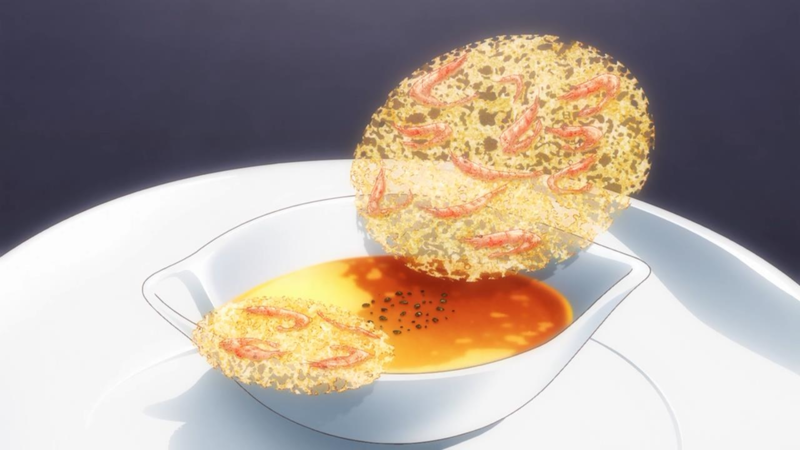 Capitone in Umido was a dish created in the first bout of the Rebels vs Central Shokugeki by Julio Shiratsu. Pure homegrown European cooking is probably why I resonate with this dish so much with rich flavours of tomatoes being the most desirable. I could eat this over and over again, but currently, I will just consume it with my eyes and imagine the taste. I would go swimming in this. If I could eat one thing for the rest of my life, it would be this. It looks so damn smooth with the broth and noodles creating the best combination of flavours ever! Not to mention it was created by the combined efforts of Sōma Yukihira, Takumi Aldini and Megumi Tadokoro after they had been disadvantaged in their second assignment of the promotion exams. This dish had me craving udon and ramen for days after it aired and still has me salivating. It was a big win for our best boy Soma, Takumi and Megumi and the Food Wars community along with inspiring multiple dishes around the globe. I had the biggest eyegasm ever when this dish was pulled out, that is why it is my number one pick. If you’d like to catch up on Food Wars, head on over to Crunchyroll for free episodes.